Har dekorert ei Toffifee eske, og brukt mine gamle glitterlim tuber for utfordring #5. hos Shopping Our Stash. Veeeeldig vanskelig å la være å spise dem opp ;) Og hos Divas By Design er det om å gjøre å ikke lage kort denne gang.. Hehe, har vel såvidt holdt meg innenfor oppgaven her! Stamps/Image: The Greeting Farm - Anya from 'Signature-01 set'. Papirloftet - Clearstamp Tiny Alfabet Firkant. Maya Road 'love ticket' clearstamp. (The text reads 'Thank You'). Paper: Simply Cards & Papercraft magazine freebie 'NitWit Collections - Never Not paper pack'. Daisy D's 'Butterfly Dot - garden green'. Regular yellow drawing pad paper for kids. Embellishments: I've used the 'AMOS Variety Pack' of 17 misc. colors glitterglues (Bottles 22ML), and misc. cat's eye chalk inks. 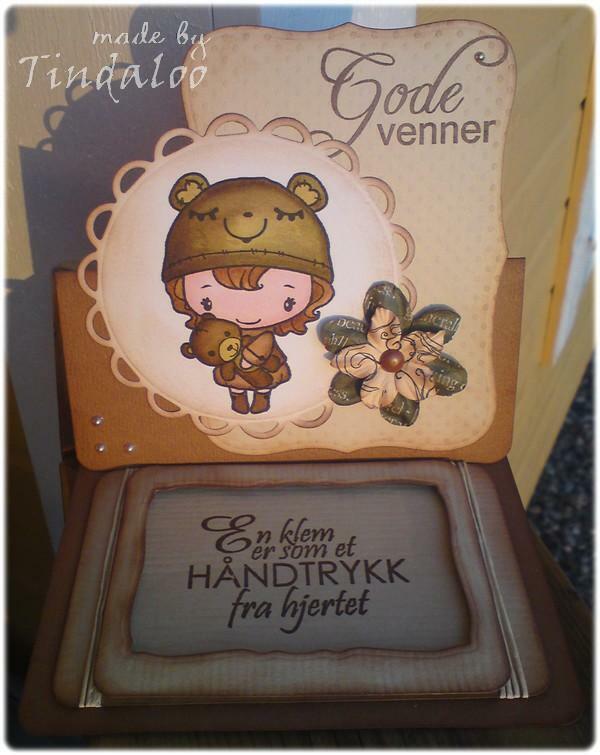 Enda et kort med Elisabeth Bell motiv ♥ By the Cute & Girly sin Juni utfordring har 'I hagen' tema. Addicted to stamps #6. er 'Sommertid', Little Darlings aller første utfordring er også 'Sommer', og Polka Doodles uke 24. 'Ting med vinger'! Stamps: Sugarnellie - Elisabeth Bell 'Fingers Crossed'. Magnolia 'Bröllups swirl'. Pink Petticoat exclusive clearstamp set 'In my Garden' (Free w. issue #83. of Simply cards & Papercraft magazine). Hero Arts Sparkle Clear Stamp set 'full of sunshine' (tiny butterfly). Papers: Bazzill cardstock. Basic grey - Ambrosia collection 'Mandarin' & Perhaps 'Elsa'. And an unknown handmade dried floral paper. Embellishments: Spellbinder Frameabilities - Scalloped Edge Frame. QK-REV-0027 Flourish (Vines). Prima flower. Eyelet Outlet big rhinestone brads. EK Success Large round corner punch. Hero Arts Sparkle Clear Stamp set 'full of sunshine' (small rhinestone flowers) & Rhinestone red flower from Quixotic. Sakura Gelly Roller glitter pens. Stamps: Sugarnellie - Elisabeth Bell 'Fingers Crossed'. Maya road 'Love Ticket' txt stamp. Tiny bugs from the Nellie Snellen clearstamp set - Koetie COW004. Papers: Bazzill cardstock. Daisy D's 'Butterfly Dot - garden green'. Reg. sketch pad paper - white, then distressed green. Embellishments: Luzia Pimpinella Ribbon - Forest Friends. Prima Flower & Prima Flower Center. Basic Grey 'Bling it' Rhinestones. Distressed papers with help of a MM edgescraper, Tsukineko Walnut ink 'Willow' + water & my Tim Holtz Distress inks. Sakura Gelly Roller glitter pens. Spellbinder Nestabilities - Labels 4 S4190. I had so much fun making my first easel card, that I've done another ~ and it went much quicker now that I know the how to! For TGF Farm Fresh Friday's challenge ~ Get Sentimental ~ I will be adding this card to the gallery> Farm Fresh Fridays 2011> Sentimental. as soon as they get the category up! Anyone For Anya? has a color challenge this week ~ Hamburger! So I got all brown shades of vanilla/beige bread to reddish meat browns & veggie greens to go with my Cuddly Anya! Any Tomato reds I've left out since I don't like 'em on my hamburgers *lol* As for the Southern Girls #21. it's nice n easy ~ Anything Goes! Stamps/Image: The Greeting Farm 'Cuddle Anya'. Norsk Stempelblad Ett Trykk - Clearstamps tekst07. (=Good Friends, =A hug is like a handshake from the heart). Paper: Bazzill swiss dots, & other cardstocks in vanilla/browns colors. Also plain cardstock on the back - colored with Walnut ink from Tsukineko & Tattered Angels Glimmermist 'coffee shop'. For my distressink / watercolored images I usually use Canson Montval or Panduro aquarelle paper. Embellishments: Prima Flowers & Basic Grey brads. Scrapmagasinet tiny bling pearls. Twine made in China. 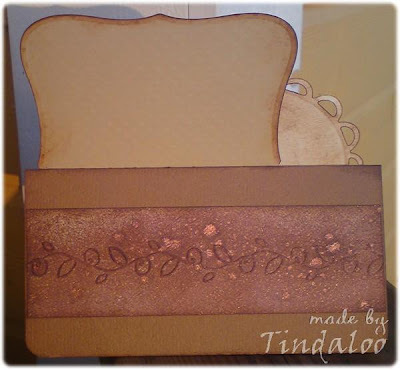 Paper Mania embossing folders set - little cake shoppe 'Tasty Trims'. Spellbinder Nestabilities - Labels 8 [S5019]. Spellbinder Nestabilities - Curved Rectangles [S5006]. Spellbinder Nestabilities - Lacey Circles [S4293]. 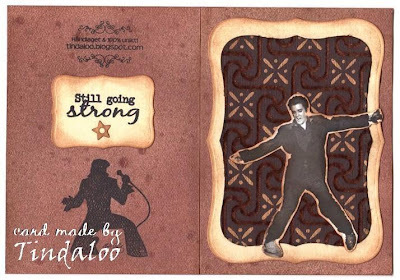 Stamps/Image: Stampavie - Mo Manning clearstamp 'Jack and ginger'. Scrapmagasinet '107 Gamling tekster'. Magnolia 'BakgrundsSwirl Bröllup'. Paper: Bazzill & Making Memories cardstock. Crafty Individuals 6x6 Background papers 'Book 1'. Fancy Pants 'All Fall' 8x8 paperpad. Embellishments: HobbyHimmelen 'Hortensia med stilk'. Spellbinder Nestabilities - Labels 8 - S5019. QuicKutz Butterfly KS-0172. QK-REV-0027 Flourish (Vines). Cuttlebug Embossing Folder BorderSet 'Just My Type'. And the image is shimmering 'cause it's painted with Twinkeling H2O watercolors! Flash Back Friday er en litt uvanlig utfordringsblogg som oppfordrer til å vise frem gamle prosjekt fra når man først begyndte å lage kort ~ noen som jeg helst ikke vil vise frem.. *lol* Men jeg hadde absolutt noen kort jeg var fornøyd med også :) Her er et par kort fra 2007, året før jeg startet å blogge! Penny Black har alltid vært en favoritt ~ Min første stempel forelskelse! ♥ 12.0 er sommerfarger. The challengeblog Flash Back Friday is a bit unusual, wich is fun for a change! It wants u to show off your oldest work ~ from back when u first started scrapping ~ and sometimes that can be embarrassing *lol* But I have some cards I am very happy with, and from my first rubberstamp-crush ♥ Penny Black, I'm showing a couple of cards from 2007, a year before I started blogging :) the theme for 12.0 is Summer Colours. 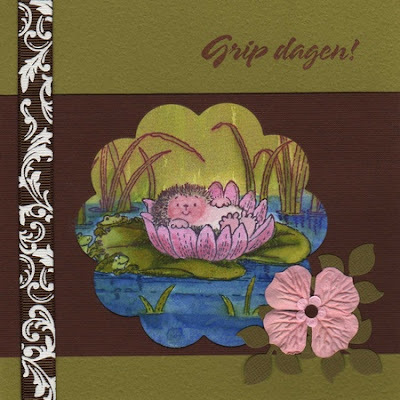 Stamps/Image: Penny Black 'Lily Pond'. 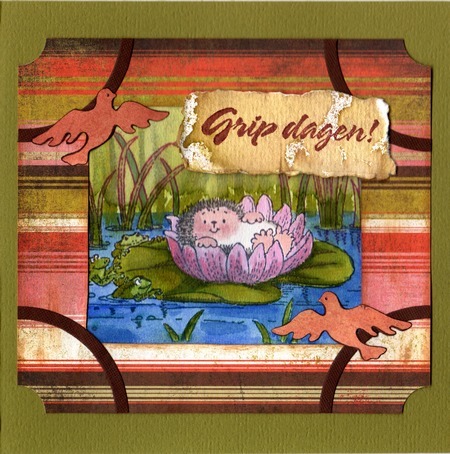 Unknown text stamp 'Grip Dagen' (=Carpe Diem/Sease the day!). Paper: Misc. Bazzill Cardstocks & scraps of papers ~ Basic Grey. Embellishments: Adornit ribbon 'Floral Creme Brown'. Prima flowers. QuicKutz Dove RS-0085. QK RS-0101 leaf, and Lim.ed. REV Circles 0072. ●Paper Sundaes #73. Girly Girl. ●Totally Gorjuss #84. Flower Power! I never get enough Elisabeth Bell stamps I think! Got more than 50 now, and she just keep on making 'must have' stamps! *lol* This girl is 'Cherry Blossom' one of her sweet designs for SCACD. ●Wee Memories #59. "Free for All"
Stamps/Image: Elisabeth Bell for SCACD Sampler ed.#2. 'Cherry Blossom'. Clear Dollar Stamps 'June Rose' text & rose. Paper: Misc. Cardstocks & scraps of papers. Embellishments: QuicKutz RS-0045 Heart. The scallops are made with the Marvy Uchida trimming buddy. Panduro Hobby Double-do - diecut Relieffstanse Bord Liljer 065300. 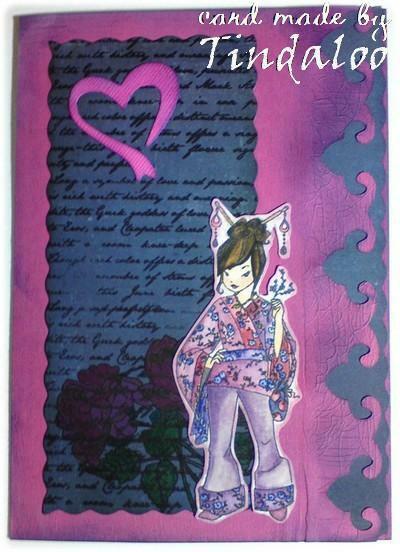 Coloring mediums used - Tim Holtz Distress inks, LePlume markers & Cats Eye chalk inkpads. 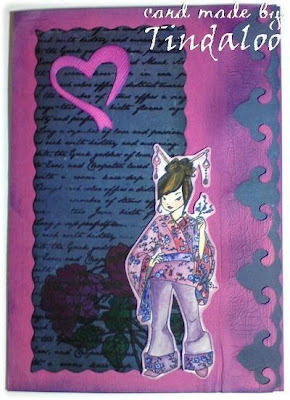 Another easy card from me, not much with the embellies ~ a whole lotta Tim Holtz inking though.. I just ♥ that man! He creates so much yummyness :) Since The Sweet Stampin' challenge blog is asking for a little bit of ooh, a little bit of aaah & a whole lot of Ooh La La, I'm using my cheeky Pink stamp! Stamps/Image: Ett Trykk - Dameansiktstempler - 7B. 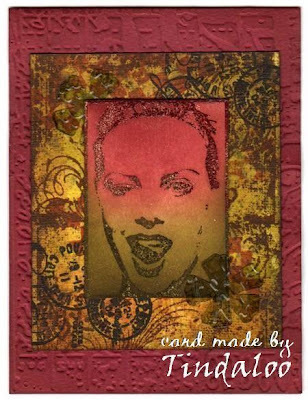 Stampers Anonymous - Tim Holtz 'Ornate collages' set. 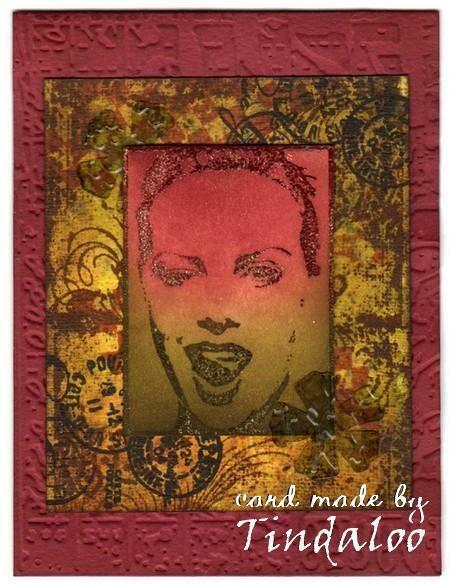 Paper Artsy Stamps 'Man of numbers 2' set. Embellishments: Clear plastic cut out with Tim Holtz Alterations Sizzix Bigz Dies 'Tattered Florals', & embossed with the Cuttlebug embossing folder 'script texture'. I used the 'Collage' embossing on the backing paper. Plus loads of Tim's Distress Inks, some alcohol inks, and heat embossing on the image! Kort O' Mania sin utfordring #41. er monokromatisk - scrap i 1 farge! Så det ble Elvis med gyldne brun toner :) Legger dette også inn til utfordringen hos the StampSmith #15. Bursdagstema. Stamps/Image: The Stamp Smith - from the 'Elvis full sheet'. Cornish Heritage Farms 'Elvis on one knee'. Scrapmagasinet - 107 'Gamling tekster'. Embellishments: Spellbinder Nestabilities - Labels 8. QuicKutz - RS-0398 star doodads. The backing cardstock is sprayed with Walnut inks & Glimmermist.